Agricultural film – agricultural film (white, green) (LDPE or silage film) free of BB, PP stripes, HD cans, free of nets, without cords, the admissible addition of soil and other organics not exceeding 10%, construction materials, films and other additions. The black agricultural film must not exceed 5%. 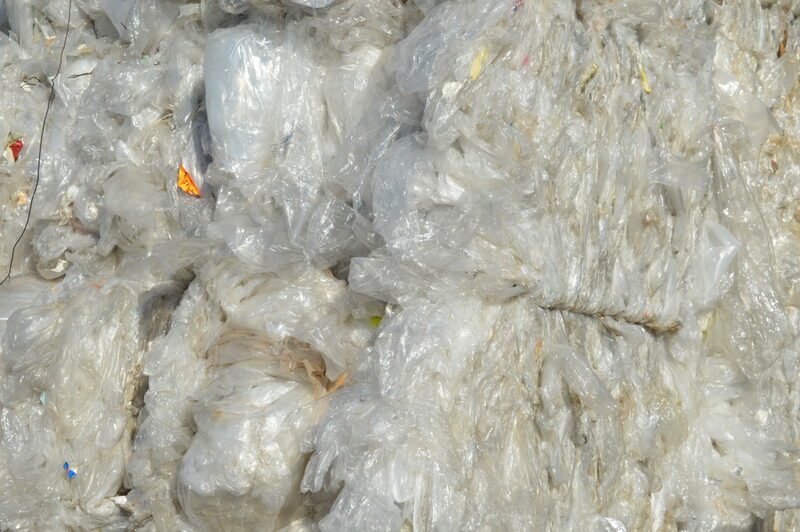 LDPE 95/5 – only clean white, maybe slightly grey, occasionally yellowish, slightly dirty, transparent LDPE. Bales held together by metal wiring (if PP stripes are used, the price will be reduced by 10-20 Eur/t). Admissible addition of a film of other colours up to 5% (coloured film, stickers, labelling, pp stripe, small print in places). This category includes BB liners recognizable by the existence of tighteners. Inadmissible additions of transparent film: PP film, HDPE film (rustling matted film: carrier bags), film of various colours (incl. white), cardboard, paper, PET sheets, pieces of coloured film, nets, destructive film (old film that has begun to disintegrate (it cannot be recycled), for example, film used for greenhouses)), metal, food waste, any additions of soil, sand. Free of hazardous or medicinal waste. LDPE with print – transparent LDPE with print. Bales held together by metal wiring (if PP stripes are used, the price will be reduced by 10-20 Eur/t). It is not a coloured film. It may also be a thick transparent film. Inadmissible additions of transparent film: PP film, HDPE film (rustling matted film: carrier bags), film of various colours (incl. white), cardboard, paper, PET sheets, pieces of coloured film, nets, destructive film (old film that has begun to disintegrate (it cannot be recycled), for example, film used for greenhouses)), metal, food waste, any additions of soil, sand. Free of hazardous or medicinal waste. LDPE 98/2 (A): only clean white non-grey transparent LDPE without additions of other coloured films, including a white film with 2% of possible additions (stickers, labelling, pp stripe, small print in places). Bales held together by metal wiring (if PP stripes are used, the price will be reduced by 10-20 Eur/t). Inadmissible additions of transparent film: PP film, HDPE film (rustling matted film: carrier bags), film of various colours (incl. white), cardboard, paper, PET sheets, pieces of coloured film, nets, destructive film (old film that has begun to disintegrate (it cannot be recycled), for example, film used for greenhouses)), metal, food waste, any additions of soil, sand. Free of hazardous or medicinal waste. LDPE transparent/thick – transparent, thick LDPE. Additions (up to 1%: stickers, labelling). Not accepted: LDPE stretch film (food wrap), a film of various colours (incl. white). Cardboard, paper, PP (rustling film, bread bags), PET sheets, APV film, pieces of coloured film, nets, destructive film (an old film that has begun to disintegrate (cannot be recycled), for example, film used for greenhouses, metal, food scraps. Any addition of soil, sand. Free of hazardous or medicinal waste. LDPE mix (A) – LDPE mix film, large pieces of coloured film, clean film, incl. from construction. Additions (up to 5%): Without HD bottles, PET bottles from chemicals, without PP and HDPE bags (rustling carrier bags), without other additions of hard plastic and wood. Free of hazardous or medicinal waste. LDPE M/B: black-and-white or white film used for agriculture with the addition of soil, peat, dirty. Dirty, used for the timber industry. Additions (up to 5%): Without HD bottles, PET bottles from chemicals, without PP bags, without other additions of hard plastic and wood. Free of hazardous or medicinal waste. LDPE black – LDPE only black film. Additions (up to 5%): Without HD bottles, PET bottles from chemicals, without PP bags, without other additions of hard plastic and wood. Free of hazardous or medicinal waste. LDPE bottles – soft, matted LDPE bottles (medical bottles used for NaCl3 solution) without needles.